This is one film I never grow tired of watching and no wonder it is still my all-time favorite. At its center is 76-year-old Professor Isak Borg, a distinguished medical scientist who travels from Stockholm to Lund with his daughter-in-law to receive an honorary doctorate. On the 400-mile car journey the old man remembers his past - the girl he loved who married his brother instead, and his own bitterly unsuccessful marriage. Despite his benevolent exterior, to which everyone pays tribute, he recognizes in himself something arid and distant. The film opens with a spellbinding dream sequence. Borg arrives at a house with boarded up windows in the old quarter of Stockholm. He sees a clock with no hands and an old hearse approaching. One of its wheels gets caught up on a lamppost and a coffin falls out. A man’s hand stretches out from the box. As Borg approaches, the hand comes to alive and grabs him by the arm and pulls at him. The dead man inside the coffin comes to life—and it is Borg, and that dead Borg is struggling with the dreamer Borg as we see parallel close-ups of the two men’s faces. There are other Expressionist and certainly Freudian dream sequences in the picture, almost always with the old man appearing in them as his present self. The transcendent performance of Victor Sjostrom as Professor Borg in this film is unforgettable. Sjostrom was the great Swedish silent-era director, who died aged 80, not long after the film was completed. Bergman considered Sjostrom as his mentor as his film “The Phantom Carriage” had greatly influenced him. It was he who made the final scene one of the most serene of all Bergman's endings. "Sjostrom's face shone", said the director. "It emanated light - a reflection of a different reality, hitherto absent. His whole appearance was soft and gentle, his glance joyful and tender. It was like a miracle". The 78-year-old actor gives one of the great performances in movie history, an unsurpassed portrait of resilient, rebarbative, unsentimental old age. The film’s sixty-year journey into the past and its fifteen- hour one through the present are registered by an endlessly expressive face that exhibits the experience of a lifetime, a subtly modulated old man’s voice and a body that learned to speak in silent films. With a tilt of the head, the flick of a muscle, a slight upward vocal inflection, he can reveal the rare emotional depths that his mind and heart are tapping. Such is the power of the performance that it is possible to view Isak Borg not as some kind of emotional cripple in need of sympathy and spiritual awakening but as a tough, proud stoic, capable of taking a critical look at an honorable, inevitably flawed life. 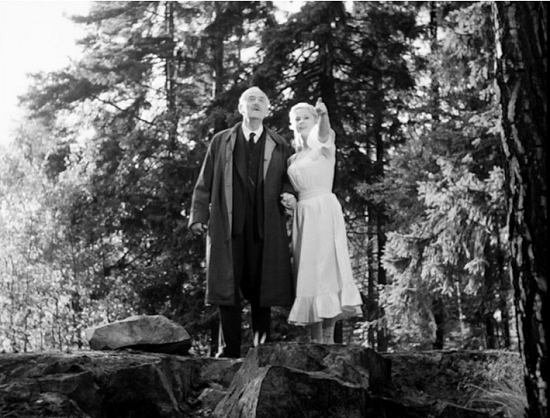 The other often neglected aspect of Wild Strawberries is that most of it was shot deep in the Swedish countryside so that its characters pass through a natural world that seems at odds with their own impermanence but whose beauty also seems somehow to instruct them. 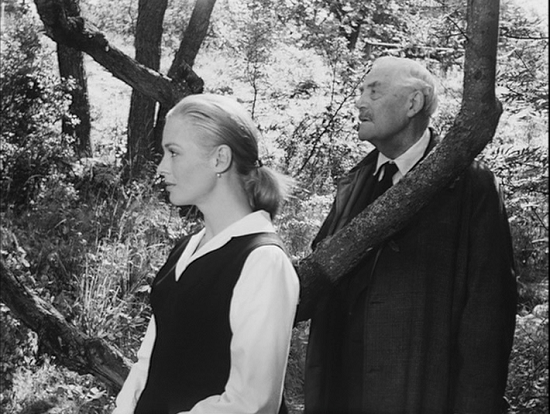 If the theme of Wild Strawberries is how life can become atrophied and sterile - often repeated from generation to generation - Bergman's working out of his argument is extraordinarily detailed, since almost all those in the film to whom this applies have no idea what is happening to them. Isak's admired and respected mother, for instance, is slowly revealed as hard and mean-spirited, though not to herself. And it is only when his daughter-in-law Marianne (Ingrid Thulin) speaks honestly to him in the car that Isak begins his journey of self-recognition. Along the way they pick up three young hitchhikers (Bibi Andersson, Bjorn Bjelvenstam and Folke Sundquist) after they stop at his boyhood home. From there, Bergman places Isak in several nostalgic reveries, juxtaposing the present with his bittersweet past. The trip becomes an odyssey of self-revelation and grudging acceptance. 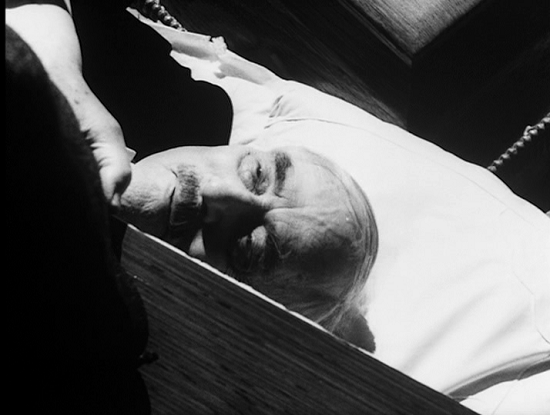 "Wild Strawberries" ends with another dream. Once more, we see the summerhouse of Borg's childhood, the happy family, the images shimmering with light. First Sara, his wife, appears . "Isak, darling", she says, "there are no wild strawberries left". Here , Borg is again telling himself that he has run out of time for life and love. "Aunt wants you to search for your father", Sara adds. "I will help you". Sara's love will enable Borg to find his father-that is, to be spiritually reborn. Finally, Borg sees his parents. His father is fishing, his mother is reading a book. They gaze at Borg across a body of water and laugh happily. Borg smiles back at them. In his "Tribute to Victor Sjostrom", Bergman refers to the final close-ups of Borg smiling at his parents as indicating "clarity" and "reconcilliation"
What makes the film one of the greatest movies that the celluloid has ever made is its nearness to each of us. And its almost Christian insistence on the possibility of reconciliation and redemption in our lives. The film is included on the Vatican Best Films List, recommended for its portrayal of a man's "interior journey from pangs of regret and anxiety to a refreshing sense of peace and reconciliation". 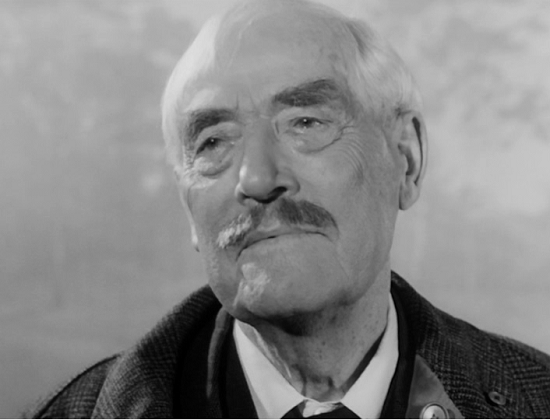 Bergman's dramatic use of light and dark to reveal the human mind and soul ranks Wild Strawberries among the world's greatest cinematic achievements. Well written. This is one of my favourite film as well.